Gerbing's NEW ‘top of the range’ heated motorcycle glove uses the innovative and revolutionary European patent pending new Microwire®. Based on the award winning XR12, the XRS-12 is Gerbing's latest ‘top of the range’ innovative and revolutionary European patent pending Microwire® heated glove. An extremely comfortable and safe glove made with an exceptionally soft and supple drum-dyed 0.6 mm premium full aniline leather that contours to the hand. 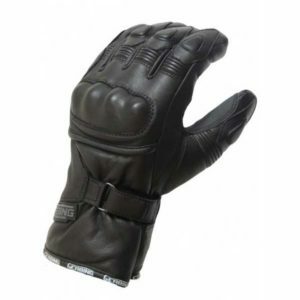 The NEW short-cuff design allows the rider to wear the glover UNDERNEATH the motorcycle jacket. ***PLEASE NOTE*** In our experience this particular glove tends to have a more snug fit than different models in the same size. Therefore, we recommend that when ordering, you choose the next size up after measuring your hand. 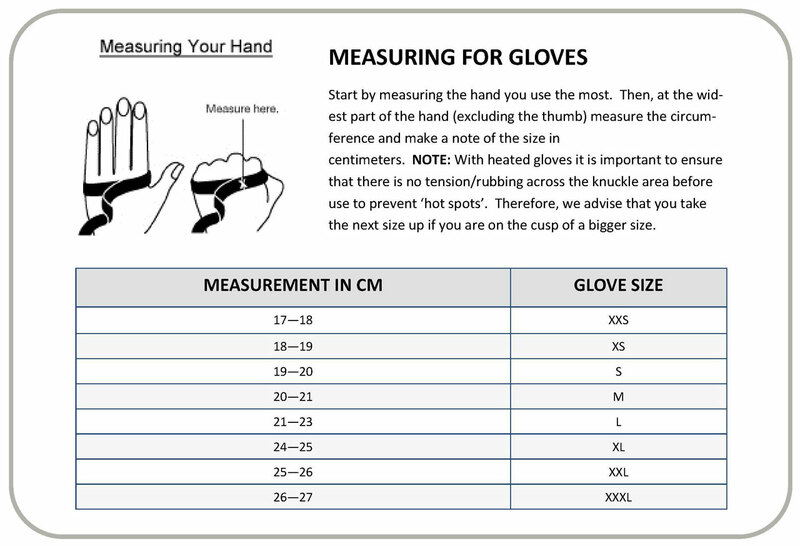 i.e If your hand measures 20cm, our size chart would indicate that you were a MEDIUM glove. However, with the XRS12 Glove you would need a LARGE. Start by laying battery harness on table. Connect the battery harness to your vehicles battery. The red lead goes to positive terminal and the black lead goes to the negative terminal, then route the harness through frame (with the rubber cover fitted on the coax plug to prevent grounding). As all Gerbing jacket connections are on left hand side, the coax plug ideally needs to be routed to the left side of the vehicle. Zip tie the loose cable in place to prevent it catching on any moving parts. You can now connect your Gerbing kit directly into the battery harness. Always plug in your kit when the vehicle is running. In order to accommodate your individual preference for heating comfort, Gerbing strongly recommends using our temperature controllers with any heated clothing purchase. 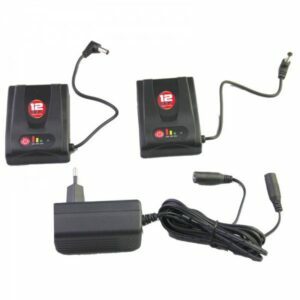 Gerbing can also plug into any 12v outlet on your bike, ATV, etc. using the BMW/Hella accessory plug. 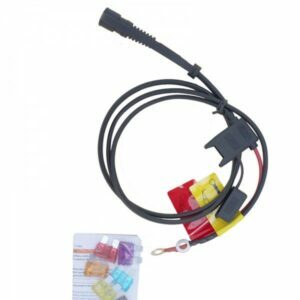 If your vehicle has a CanBus system installed, we recommend using a battery harness to bypass the CanBus system. Decide which size your 12v outlet is. Most are either Hella sockets or the standard Cigarette lighter socket. For cigarette type sockets leave the red cap on. For Hella type sockets (BMW, Triumph, Ducati etc) turn the red cap 45º and pull off. The plug will now fit. Make sure you have the correct fuse fitted for the Gerbing kit you are using. Making sure your vehicle is running, first connect your heated clothing into the adapter and then plug into the socket. Despite the Lifetime Warranty on Heating Elements, the majority of warranty claims arise due to lack of care. 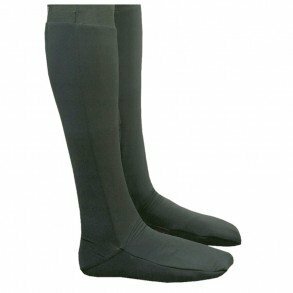 Gerbing kit is well made and robust, treated well it will keep you warm and safe for many years. Some customers are still using kit that is over 18yrs old. Always keep the rubber cap on the battery harness when not in use. Even when your Gerbing kit is not plugged in (for instance during the summer months) there is a tiny charge going through the plug and if its damp, over a period of time the plug will corrode. Ensure you remove the fuse in the summer time to avoid corroding of the plug. All the plugs should be treated with a damp inhibitor such as WD40 or ACF. Gloves should be treated with a leather conditioner/waterproofer such as Nikwax. Our gloves use a waterproof Hipora liner however, this liner is underneath the outer skin of the glove which will still soak up water if not protected. Jackets, trousers and socks can all be washed by hand using a mild detergent. Hang on a line to dry naturally - do not tumble dry. All our kit can be rolled tightly for packing. Our human bodies constantly give off heat, as a result our skin heats the air around it. Consequently, the layer of air surrounding our skin becomes warm and forms something similar to an invisible, heated “air jacket.” However, when wind blows, this warmer air around our skin gets quickly blown away and is replaced by the colder moving air of the wind. The faster the wind blows, the less of a chance we get to heat the air in contact with our skin - therefore the colder we feel ! During summer months the use of riding kit makes this phenomenon all but redundant. However during the winter months even the best clothing will struggle to maintain this envelope of warm air around you. Gerbing Heated Clothing artificially introduces a new and warmer air jacket around your skin that is constantly replaced even at high speeds when the wind chill is increased, making your journey more comfortable and arguably safer. To make this clearer, when riding a motorcycle at 70mph with an outside temperature of 0ºC, the wind chill factor will result in a temperature equivalent to -11ºC! Reaction times at this temperature are considerably slower this, in turn, could make all the difference in an emergency situation. 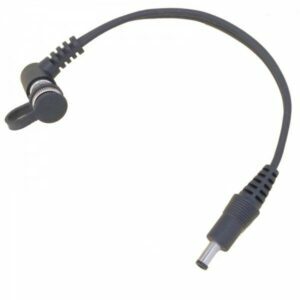 Gerbing Battery Hook Up Cable is designed for Gerbing's heated gloves or heated insoles. Supplied with battery harness and long Y-Lead.